The Carolina Hurricanes wrapped up a 6 game road trip in spectacular fashion last night in Newark. In what is the best road swing the Canes have been on in recent memory, the Canes went 4-1-1 over the stretch, both of their losses coming against the Flyers in Philadelphia. After a come-from-behind win against the Islanders, the Canes took to the ice against one of the East’s best teams in New Jersey. The Canes were able to outskate and out play the Devils on home ice and come away for their 4th win in the road swing. Cam Ward got the majority of starts in between the pipes for the Canes and looks to be returning to mid-season form after a shaky start. He got back to back wins in New York and New Jersey and looked stellar for much of the road trip. The defense in front of Ward has been suspect at best, and Ward has been able to steal a couple of games for the Hurricanes. The main reason for the surge though has to be the emergence of a true first line. For years, Caniacs have been calling for a true first line winger that can complement captain Eric Staal’s play style. While he and Jiri Tlusty showed good chemistry together last season, that top-flight winger was the big missing piece to a solid offensive product. The Hurricanes found their man in free agent Alex Semin over the summer. Semin and Staal have been dynamite on ice lately, and they are both scoring at will. Semin has a knack of feeding Staal, or vice-versa, and Tlusty is also benefiting from being on that line. Staal is currently on a 10-game point streak and has 8 goals and 8 assists through 12 games. His +/- of +12 leads the National Hockey League. Coincidentally, Alex Semin is second in the league at +11, and Tlusty is 5th at +10. 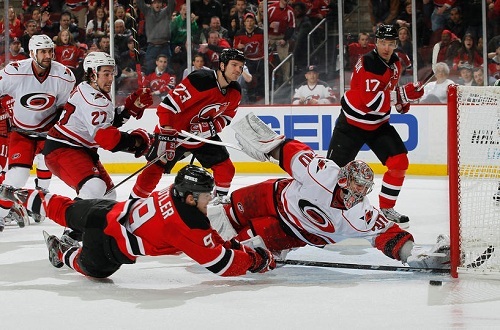 NEWARK, NJ – FEBRUARY 12: Cam Ward #30 of the Carolina Hurricanes makes a diving save against Bobby Butler #9 of the New Jersey Devils late in the third period during the game at the Prudential Center on February 12, 2013 in Newark, New Jersey. The Hurricanes defeated the Devils 4-2. Staal’s turnaround can be attributed to his linemates producing at an incredibly high level. At the end of last season, Staal was a -20, which was good for 879th in the NHL. The improvement has been incredibly noticeable, and the Captain has his team leading the Southeast division, and third in the Eastern Conference. Another thing that may be contributing behind the scenes is the emergence of younger brother Jordan Staal. While the brothers rarely play on the same line, you have to think they are pushing each other on and off the ice in a friendly sibling rivalry. Jordan leads the team in assists currently with 10. The Canes return home tomorrow night against Toronto, and hope to keep this incredible streak alive. They have earned at least a point in 5 straight games, and currently lead the division by 2 points at the quarter mark of the season.